I would like to wish all my friends and followers a very Happy Christmas and a Happy and Healthy New Year. Thank you to all who have left me lovely comments during the year - these are much appreciated and I will try to visit as many as possible in the coming months and try to post something on a fairly regular basis. 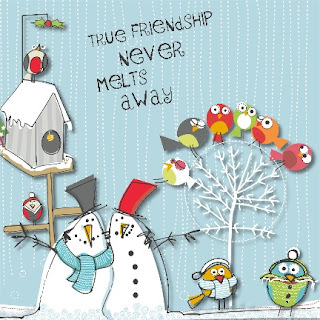 This card was made quite quickly using Craft Artist and I hope it will make you smile! A gorgeous CA make Val, I use CA mostly for manipulating pictures and backing papers I must try making a card using it some when. Hope you have a great Christmas and a very Happy New Year. See you in 2017. This is a great picture. Hope you have a lovely Christmas Val. This is a brilliant Christmas card .. .. I love it! Especially the cute characters and that lovely sentiment. I hope you had a lovely Christmas and wish you all the best for 2017 when it arrives. Aww - a very sweet card. Wishing you a Happy New Year Val. Oh my gosh this is just the cutest card design.